The goal of the LEONID Multi-instrument Aircraft Campaign is to study all aspects of the composition, morphology and dynamics of cometary dust, the chmistry and physics of accretion of extratessetrial material in Earth's atmosphere, and their effects on the Earth's environment. The ASUR sensor will for the first time allow to directly measure key atmosphric species such as HCN, NO, and Ozone at the exact moment and location when comatary dust enters the mesosphere. The chirp-transform spectrometer, which was recently implemented into the ASUR instrument, allow to cover an altitude range that extends well into the mesosphere. First measurements of these molecules with this new spectrometer were performed already in January 2002 during a SCIAMACHY validation test campaign. Targeted molecules will be the meteoric ablation products HCN and possibly H2CO. These molecules are known constituents of cometary ices [e. g. Mumma et al., Bockelée-Morvan et al., 2001, and references therein] . Their potential to stay intact during meteoric ablation might result in a source of organic material in the Earth's atmosphere. The meteoric contribution of HCN and H2CO could be important for our understanding of the origin of life on Earth [e. g. Chyba and Sagan, 1997, Jenniskens, 2001, and references therein], so Leonid MAC is ASUR's first mission related to astrobiology. Further ASUR will measure the atmospheric constituents NO and Ozone, which are important species in the mesospheric chemistry. They may be influenced by meteoric energy deposition in the mesosphere and variations of other chemical species. Simultaneous measurements of OH, O2, Na, and OI by other instruments at infrared and visible wavelengths will allow to track such processes. Click here for a background article on Leonid MAC research (provided by the Astronomical Society of the Pacific). Picture of meteors taken from the article by J. Rao, "The return of the LEONID meteors", Sky and Telescope, November 1998. Mumma, M. J., et al., Organic Composition of C/1999 S4 (LINEAR): A Comet Formed Near Jupiter?, Science, 292,, 1334-1339, 2001. Bockelée-Morvan, D., et al., Outgassing Behavior and Composition of Comet C/1999 S4 (LINEAR) During Its Disruption, Science, 292, 1339-1343, 2001. Chyba, C. F., and C. Sagan, Comets as a Source of Prebiotic Organic Molecules for the Early Earth, in: Thomas, P. J., C. F. Chyba, and C. P. McKay (eds. ), Comets and the origin and evolution of life, Springer, New York, 1997. The origin of the Leonids is debris released by comet 55P/Tempel-Tuttle. This comet has a highly elliptic orbit and needs about 33 Earth years for one revolution. In November 2002 it is expected that the Earth encounters two major trails with debris released by comet 55P/Tempel-Tuttle. These trails were ejected when the comet approached the sun in the years 1767 and 1866. 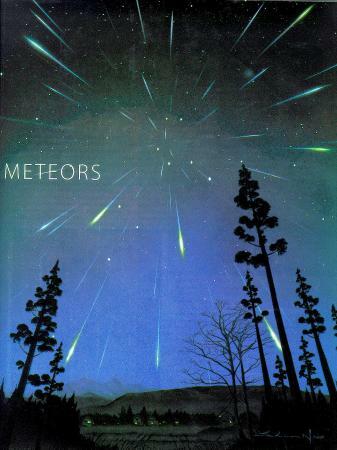 Models of meteor activity [McNaught and Asher, 1999, Lyytinen and van Flandern, 2000, Jenniskens, 2001] therefore predict two large meteor storms. 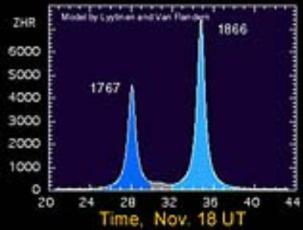 The first peak is predicted to be visible from western Europe and western Africa on November 19, at about 4:00 UT. The second peak will be stronger than the first one. It will occur between 10:13 and 10:44 UT, located over North America. The predicted zenith hourly rates (ZHR), a measure for the intensity of the storm, vary between 5700 and 10000 for the second peak, depending on the model. However, this meteor strom will be stronger than the storms observed during the last five years and no storm of comparable strength is predicted for the next century. These plots are based on the information given on the LEONID homepage. McNaught, R. H., and D. J. Asher, WGN, 27, 85-102, 1999. Update (2001) on http://www.atnf.csiro.au/asa_www/info_sheets/leonids.html. Lyytinen, E., and T. van Flandern, Earth, Moon, Planets, 82-83, 149-166, 2000. Update (2001) on http://www.saunalahti.fi/fmbb/astro/2001leonidstorm.htm. The predicted meteor rates for 2002 offer a unique observational opportunity. Therefore the airborne mission is planned to take place on November 19. Both the research aircraft FISTA, operated by the US Air Force, and the NASA DC-8 research aircraft will be deployed. They will carry spectrometers from ultraviolet to infrared wavelengths. ASUR will be deployed on the DC-8 as this was already done successfully during the SOLVE/THESEO-2000 mission. It will contribute for the first time measurements at submillimeter wavelengths right at the location of maximum intensity of the meteor strom. As there are two predicted meteor maximums, which are located over western Europe and continental USA, the mission will lead the aircraft from Edwards, California, to Madrid, Spain, two nights prior to the strom. In the night of the storm the aircraft will head west. This will offer the unique oppotunity to observe the first intensity maximum over western Europe and a few hours later the second maximum over continental USA. The Leonid Multi-instrument Aircraft Campaign is carried out in close cooperation with NASA, the US Air Force, ESA, and the SETI-Institute. The international collaboration includes participants of research institutes and universities in Europe, the United States, Canada, and Japan. The participation of ASUR is funded by the Federal State of Bremen. 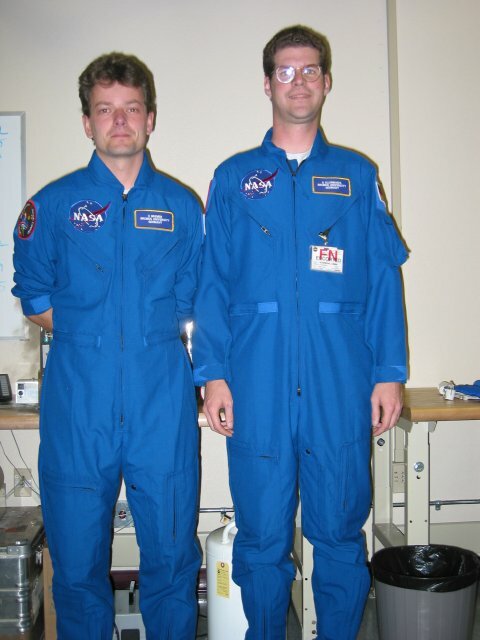 Holger Bremer and Armin Kleinböhl in their new flightsuits. 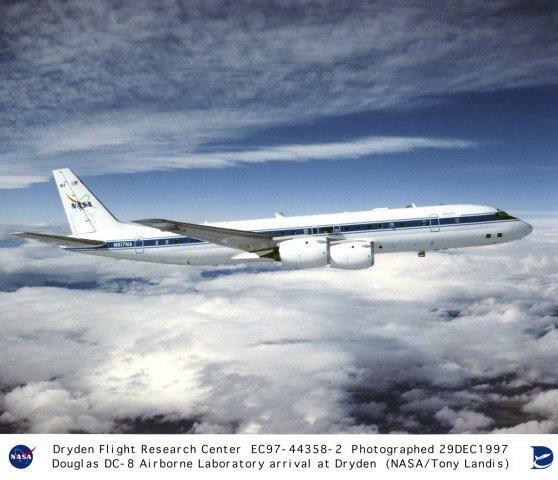 NASA's airborne laboratory DC-8, the second aircraft for LEONID MAC 2002, in the air.